The history of rubber is quite fascinating. The stories of how rubber was discovered vary depending on who is telling the story. One story tells of a Mayas Indian woman who was walking through the rain forest gathering edibles when she came across a crying tree. She took a sample of the tears back to the tribe’s chief who found the latex substance unique. Maybe you have heard that Christopher Columbus was responsible for discovering rubber after visiting Haiti in the 1490’s and watching the natives play with a bouncy ball. Or even better, how a French astronomer in 1736 was sent to Peru by his government and returned with samples of a white fluid consistency of honey. Though, these stories have great likelihood, the story with the most impact on rubber as we know it today is Charles Goodyear from Trenton, NJ. You may think Charles Goodyear was the founder of Goodyear Tire Company, but you would be incorrect. The company was named after Charles, but did not go into business until years after his death. Rather, Mr. Goodyear is considered the first inventor to vulcanize rubber. It all started after Mr. Goodyear walked into a store to purchase a rubber life-preserver in 1834. After his purchase, he became obsessed with the material and how it could be useful. Shortly after, Mr. Goodyear was granted a U.S. Government contract to make rubber mail bags, but in making the mail bags, they began to decompose quite rapidly. See, rubber had two essential problems; it became sticky when it was hot and stiff when it was cold. Even though merchants have been known to use rubber in clothing and on shoes since 1820s, it wasn’t until Mr. Goodyear accidentally discovered the process to cure the entire mass of rubber rather than just the outside in 1839 that made the biggest impact. In 1844, Mr. Goodyear was granted a U.S. patent for his discovery, but unfortunately, he would not make a dime off of it. Rather he died in 1860, a poor man. While Mr. Goodyear was making his discoveries in America, across the Atlantic Ocean, another inventor named Thomas Hancock was doing the same. He would later be given credit for the name “vulcanization” which was said to come from the God Vulcan of Roman mythology. Mr. Hancock also invented an internal mixer which would simplify the adaption of rubber to other textile. 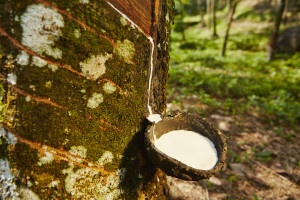 As rubber popularity and demand increased, so did the problems associated with gathering natural rubber. Unfortunately, rubber farmers were ruthlessly exploited, while supply and transportation became a major issue. It is said that in 1876, an Englishman gathered seeds from Brazil and returned to England. Seeds were disbursed to the Far East as well. This action began the increase in rubber tree farms across the world. In 1889, John Dunlop of England produced the first commercially successful tire for bicycles and would later create the first automobile tire in 1906. As the auto industry began taking off after 1910s, rubber continued to be a hot commodity. The progression of World War II showed the vulnerability of rubber supply as many countries struggled to get enough rubber to produce weapons and supplies. It became increasingly apparent that a natural rubber alternative was needed. Chemists across the globe were actively trying to invent an artificial version of rubber, which would be called synthetic rubber. In 1910, history tells us that the Russians were the first to prepare a synthetic rubber called Polybutadiene. The Germans would follow 20 years later with a commercial rubber called Buna-S (Styrene Butadience Copolymer). In the United States, a research and development project was initiated by the government along with the industry to develop Styrene Butadiene Rubber or what is referred to now as SBR. DuPont produced Duprene, which is now called Neoprene. Germans created an oil-resistant rubber called Buna-N or Perbunan. DuPont would release Hypalon and Viton; Bayer produced Polyurethane. Ethylene Propylene Terpolymer Rubber or EPDM was created; Also Shell created Shell Isoprene Rubber and Goodyear produced Natsyn or Polyisoprene. More recently, Thermoplastic Elastomers were invented. These materials behave like rubber, but soften like plastic when heated. All of these inventions would have a significant impact on the rubber industry. It is thought that natural rubber makes up one-third of all rubber manufacturing.